'Autism' literally means 'selfism'. It was first identified by a psychiatrist, Eugen Bleuler, in 1911 and he used the term to describe the social withdrawal which he saw as one of the key symptoms in patients of his with schizophrenia. Autism is considered to be a disability which lies on a continuum (or 'spectrum'), with people being affected to different degrees of severity. There are approximately four times as many boys as girls with Autism. Autism is a developmental disorder which affects a child's social and communication skills and impairs the natural instinct within them to relate to their fellow human beings. Children with Autism show little curiosity or imagination and frequently seem uninterested or indifferent. They also often have accompanying learning disabilities. 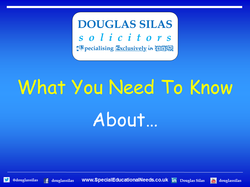 Asperger Syndrome is related to Autism at the more able end of the spectrum, and pupils with Autism who have been integrated into mainstream provision are often those described as having Asperger Syndrome. In some cases children with Autism may have an isolated area of ability, i.e. one or two skills in which they are markedly more advanced than in their general developmental level. This, however, is a rare occurrence, and certainly not typical of pupils with Autism. "WHAT IS AN AUTISTIC SPECTRUM DISORDER?" In recent years there has been an increase in the number of children and young people identified with Autistic Spectrum Disorders (ASDs). Autistic Spectrum Disorder is a relatively new term to denote the fact that there are a number of subgroups within the spectrum of Autism. These range from low-functioning/severe at one end to high-functioning (sometimes referred to as Asperger Syndrome) at the other end. think and behave flexibly — which may be shown in restricted, obsessional or repetitive activities. Some children with an ASD have a different perception of sounds, sights, smell, touch and taste which affects their response to these sensations. They may also have unusual sleep and behaviour patterns and behavioural problems. Children of all levels of ability can have an ASD and it can co-occur with other disorders (for example, with sensory loss or Down's Syndrome). Some experts on ASDs are beginning to view children with an ASD as having a different perspective and experience of the world. This view redirects the focus away from trying to change the child with an ASD. It encourages people to value the child's abilities and the child to develop their interests and activities. This requires a balanced and empathetic approach. It may be necessary to adopt specific strategies in relation to particular areas of difficulty in order to assist a child to maximise their potential and preserve their dignity: from toilet training for a child who is profoundly affected to supported social skills guidance for a child who wishes to engage with his or her peers. "WHAT ARE THE AREAS AFFECTED IN ASDs"
There are several areas affected in ASDs including: non-verbal and verbal communication; social understanding and social behaviour; thinking and behaving flexibly according to the situation; and sensory perception and responses. Children and young people with an ASD have difficulty in understanding the communication and language of others and also in developing effective communication themselves. Many are delayed in learning to speak and some do not develop speech. Many children with speech still have difficulties in using this to communicate effectively. It is likely that they will need to be taught the purpose of communication, a means to communicate (using pictures, photos, gestures, spoken or written words) and how to communicate. A key characteristic of children with an ASD is their difficulty in understanding the social behaviour of others and in behaving in socially appropriate ways. Other children develop this understanding without being explicitly taught and do so fairly easily. Children with ASDs are very literal thinkers and interpreters of language, failing to understand its social context. For the child with an ASD, other people's opinions may have little or no influence on their behaviour and the child may say and do exactly as they want. Children with an ASD often find it hard to play and communicate effectively with other children who may be confused by their behaviour and may avoid or tease them. Adults who do not know the child or know about autism, may misunderstand the child's behaviour and view it as naughty, difficult or lazy, when in fact, the child did not understand the situation or task or did not read the adult's intentions or mood correctly. Children with an ASD often do not play with toys in a conventional way, but instead spin or flap objects or watch moving parts of toys or machinery for long periods and with intense concentration. Their play tends to be isolated or alongside others rather than with others. Some children develop a special interest in a topic or activity which may be followed to extreme lengths. Any new skills tend to be tied to the situation in which they were taught which means that children with an ASD will need specific help to generalise skills. They will also have difficulty adapting to new situations and often prefer routine to change. It is evident that some children are over-sensitive or 'under-sensitive' to certain sounds, sights and textures. This has implications for the child's home and school environment and may explain their response to changing clothes or food and their response to noise.